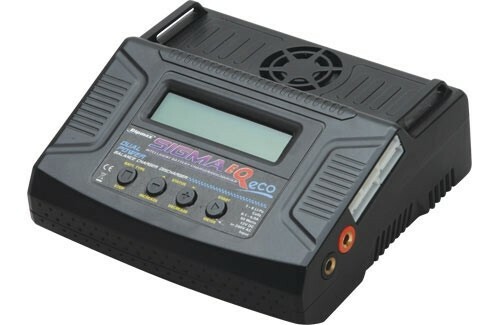 With a maximum internal circuit power of 50W and a variable charge current of up to 6.0A, the Sigma EQ LiPo Battery Charger is a versatile and easy-to-use unit. With charging and discharging cycles, this charger does just about everything a modeller could need. Supplied with balance ports adaptor board to suit Impulse, Flight Power, Thunder Power and many other batteries with optional EH and PQ boards also available. The Sigma EQ ECO can be further enhanced with an optional temperature sensor. This charger is build with a strong high quality light weight plactic case with intenal heatsinks for efficient cooling! Input Voltage: 10.0~18.0v DC or 240v AC. Current Drain (for balancing): 300mAh / cell. Ni-MH/Ni-Cd Cell Count: 1~15 cells. Li-Po/Li-Ion/Li-Fe Cell Count: 1~6 cells. The charger itself is fantastic. It's a plastic case but this is very solid feeling with a soft touch type plastic. It has a lot of functionality - probably more than I'll ever need. The manual, although very comprehensive, is rather baffling - at least for a relative novice like me. Fortunately there are numerous videos on YouTube for this and similar chargers so it didn't take long to get up and running. Once I'd figured it out, the charger itself is actually pretty simple to use - you'd never guess that from the manual!